Discussion in 'Recruiting Archive' started by Jared Grubbs, May 5, 2016. 2018 class is loaded in Indiana. Indy Hooisers 2018 team I just watched has Eric Hunter, Damezi Anderson, Caleb Brown, Aaron Henry, and Jamal Harris. All interest me, on varying levels. They beat G3 (Kevin Easley) to move to championship. 13 points (three 3-pointers), plus a crucial dunk to put BD up four with less than two minutes left in a 50-42 win at Carmel last night. He recently received an offer from Bradley. 12 points, 9 rebounds, 9 assists in a win over Avon. Nebraska was in attendance for Henry. I know LN was severely undermanned, and without their coach, for some sort of violations. 18 points in a 91-37 rout of Cathedral on Friday. He was also at the game today with Eric Hunter. Henry had a team-high 16 points (10-11 FT) in a 53-45 win over Pike in the Sectional opener last night. I think Pike had won five straight sectionals. Ben Davis is about to win Regionals. They upset North Central this morning and are dominating Connersville right now. I watched all 3 regional games at Southport today (as did the entire population of Connersville). Henry was alright, but I didn't really see anything that made me think, man I hope we get this guy. I haven't seen him in person yet. I might be able to go watch semi state, I'm not sure. Henry did not disappoint tonight and yes CH was there. Ben Davis held Connersville to 6 pts. in the 2nd and 3rd quarters. So which one was it? The one who didn't disappoint or the one that was nothing special? Even though I live in Wayne township last night was my first time to watch Henry. I was impressed. He shot well, rebounded well, defended well and appeared to play within the team concept. What's not to like? 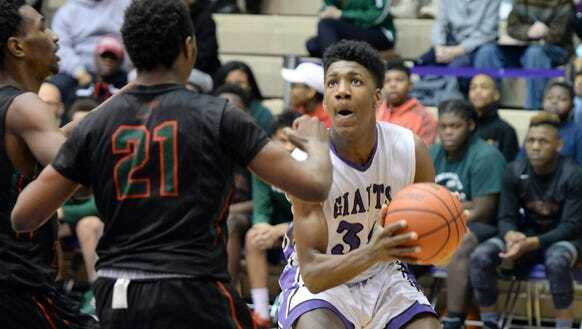 Ben Davis is not a one man team but he was easily the best player on the floor. Connersville was completely overmatched. Speed kills. Could he play for BU? Based on what seen in 1 game, yes. Henry is a big strong bodied kid with skills and leadership. I mean, he's not a bad player. But is he a Big East player? I didn't see it. He had 11 pts. And 3 of those were a half-court heave. That game, he wasn't even the best player on the court for Ben Davis - and if I wasn't a daily reader of this board, I wouldn't have even known he had Butler/high-major interest. Like I said, I think he was still pretty good. But I didn't walk away from the game hoping he'd be a Bulldog. Ben Davis did dominate the game. Connersville played very uncharacteristically last night. They don't have a ton of depth to begin with and could only get limited minutes from one of their best players. Each of Connersville's 2 losses this season happened when they played a morning game, and then turned around to play later the same night. The team mostly plays 6 or 7 players, so the lack of depth really shows in the second game of a day. Ben Davis will square off with Castle in Seymour at 1:00 pm Sat. Ben Davis plays Castle in Seymour Sat. at 1:00 pm.